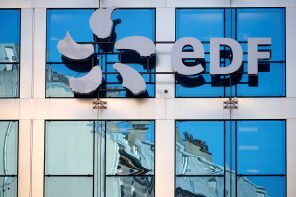 France’s EDF is selling its quarter-stake in fellow utility Alpiq for $489 million. That helps existing Swiss investors take the group private. But it also fits with a wider trend where European states are happier with vital infrastructure being held by domestic owners. The Portuguese utility will sell assets to cut debt and invest in renewables. It looks like a balancing act between the demands of activist Elliott, and Portugal’s government. But the potential boost to EDP’s value bolsters the case for rejecting an offer from China Three Gorges. The UK’s biggest energy supplier slumped after warning of a hit from a state price cap. Centrica is a random mix of retail customers, nuclear, gas and new tech. But its halving in value since 2017 offers a way for utility wannabes like oil majors to quickly bulk up. A $4.9 bln government lifeline is the bare minimum needed to keep indebted utility Eskom afloat. Likely union resistance to mass layoffs means consumers will have to swallow higher electricity costs. President Cyril Ramaphosa can only hope hikes are delayed beyond a May election. The troubled California utility wants to replace half its board, but shareholder BlueMountain proposes a full reset. A complete overhaul is rarely wise, but in PG&E’s case it could be helpful. The catch is, looming bankruptcy means the activist fund may not be the best advocate. The activist investor objected to China Three Gorges’ offer for the Portuguese utility. The deal was struggling, and Elliott’s plan, to invest in renewables, isn’t controversial. But the Chinese group’s large shareholding could still be a problem for Paul Singer’s fund. The California utility has filed, despite having a $20 bln surplus of assets over liabilities, offers of finance, and one less big wildfire to worry about. The company hasn’t yet made a persuasive case for choosing a process that will surely be lengthy, expensive and distracting. The hedge fund firm wants to oust the California utility’s directors, who are heading toward bankruptcy. It has a point: The hit from wildfires is not yet defined, and PG&E has stumbled in other ways. But BlueMountain is running out of time to rouse bigger, longer-term owners. The utility is readying a bankruptcy filing, facing $30 bln of fire-related liabilities partly thanks to the Golden State’s questionable legal norms. Poor planning, including inadequate insurance, was its own fault. But state and other government actors have also fallen short. The UK energy group’s plan to merge its retail unit with that of Germany’s Innogy collapsed, after a price cap undermined the transaction’s logic. Innogy can still do a deal with new owner E.ON. SSE’s transition to renewables looks murkier, and its generous payout more fragile. Plans to fix a $30 bln debt crisis at the state power group hurt everybody but bondholders. Besides a state bailout and tariff hikes, the utility wants to cut a third of its wage bill. Union pressure and weak government finances mean private lenders could have to take a loss too. State giant Eskom is rationing electricity supplies while seeking debt relief from the government. Big staff cuts would shrink losses and help assuage nervous bond investors. That will be tough for President Cyril Ramaphosa, but may be the only way to keep the lights on. The California utility may be to blame for the wildfire that’s claimed 48 lives. Its value has halved and it may run out of cash. The planet’s warming is already worsening fires, floods, and water scarcity. Yet most investors and companies still treat it as a longer-term risk. Carolina power companies grapple with hurricane damage while a Massachusetts gas firm is reeling from explosions. California’s push for green energy could hurt credit. Even after decades of rising investment, power companies will struggle to strengthen and modernize networks. SSE’s shares dipped after high temperatures and gas prices forced a profit warning. A cap on tariffs for retail customers will hit the sector further. And all energy companies have to work out how to cope with the falling cost of renewables and competition from new entrants. The utility is reining in dividends and spending 12 bln pounds to restore ropey infrastructure. Given a Labour government under current opposition leader Jeremy Corbyn might nationalise the sector, caution is wise. But Thames’ inability to cut bills still leaves it an outlier. What makes Connecticut Water so tantalizing? SJW is now paying a one-third premium for the staid Nutmeg State utility. It may flush away rival bidder Eversource and stalker California Water. But the investment return will be low. It only makes sense as a way to invest in infrastructure and prepare for a wave of water deals.